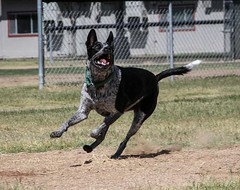 ACD Vader: From Rescue pup to local Disc Dog Champ! In case you have not heard the news yet and are preparing to or contemplating the idea of competing in a Skyhoundz event, you might want to know that as of July 1st, 2016, Skyhoundz (SH) events will now only allow you to compete with Hyperflite (HF) discs in their events. The bottom line is that it is what it is and you can either get on board or not. It's your call. If you live in a SH zone where that's the only kind of competitions you can get to, you probably need to just deal with it and move on. Disc restrictions are nothing new. But they are new from SH. This new rule has sparked quite the conversation out there among the disc dog enthusiasts of the world. The reactions have ranged from hostile, to disgruntled, to resignation, while others are irked by the timing of this change, being that it comes in mid-season. Some have called this extortion, while others are accepting of the change. As I see it, it is what it is. If my disc dog Vader finds himself facing a potential competition hosted by SH, we'll have to dig a bit deeper in our pockets to buy discs we don't normally use. They also sell the classic Fastback Frisbee Disc with the HyperFlite Skyhoundz logo on it. It measures out at 9 5/16" and weighs around 104 grams. There's also their brand new Hyperflite Zdisc, which comes in red, purple, blue and white. It too costs $4.35 a piece. it measures out at a 9.25" diameter and weighs in at 114 grams. COMPARE THESE HF disks to the popular Hero Disc USA "Hero Xtra 235s"
The Hero Xtra 235 comes in white, purple, blue, green, yellow, orange, red and pink. Orange is the hugely popular color. I know because if I don't time it right, I find myself being told they are out of stock on that color after the season starts. These disks weight 105 grams, +/- 2 grams and the diameter of the discs are 235mm*. They cost $4.99. Unless you buy the blems, but that's for another story. *Oh, 235mm equates to 9.25197 inches. This is the same size as HF's new Zdisc. Many competitions I attend allow use the 235s. Vader prefers the Hero Disc USA Super Aero K9 Candy that weigh 111 to 116 grams and have the same dimensions as the 235 discs, 2135mm. I use Hero Xtra 235s to practice out on the field without my dog. The K9 Candy discs have withstood his hard bite for over a year's worth of constant use while other discs come apart within a week of use. The blems cost half as much. I went through a lot of discs and money trying to find one my disc dog likes and when I put different discs down on the ground, he'll always choose the Super Aero K9 Candy discs and literally throws the others to the side of the pile. Who this new rule from Skyhoundz impacts can vary, depending on your perspective. Each manufacturer has their own spin, rules and restrictions on the sport and players need to adapt from one to the other. There is no universal consistency. There is no one board of directors, so to speak. HF says they've been restricted from events as other hosts have disc requirements. The other folks this change could impact are the sponsored players. Will Hero Disk players continue to participate in HF events, but just wear their sponsor's shirts while using HF discs? In my experience a sponsored athlete has unique restrictions on what they can do, use and even wear. Another category of player this will impact is the budget restricted player. There are those that love this sport and have spent what they can on what they have and this new required expenditure could limit their participation. Or it can impact the player who just days before this change was announced, ordered a few hundred discs of another brand. Now what? For both club or player? 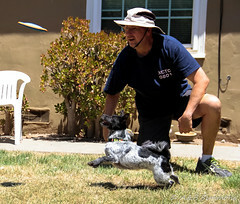 Skyhoundz has selected Hyperflite flying discs as the official flying discs of Skyhoundz World Canine Disc Championship Series. 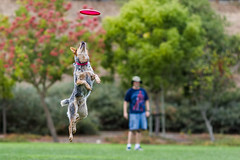 As such, at all Skyhoundz competitions (including, but not limited to, Local Championships, State Championships, DiscDogathon Qualifiers, Skyhoundz Classic Qualifiers, Xtreme Distance Qualifiers, DiscDogathon World Championship, Skyhoundz Classic World Championship, and Xtreme Distance World Championship), competitors are required to use Hyperflite discs. " If you were to take this statement at its word, I would guess anything with the Hyperflite logo on it falls within the category of "Hyperflite Discs." But I've seen others question which disc these rules apply to. I think SH and HF need to clarify a little bit more. Maybe. In a statement/press release that Skyhoundz sent out to various clubs, and you can take from it what you will. The wording in both the "press release" and the "defense" of the new rule, can seem somewhat defensive, depending on the tone you choose to read it with. The statements are attached below. Exclusive disc policy effective as of July 1, 2016. Skyhoundz has selected Hyperflite flying discs as the exclusive flying discs of the Skyhoundz World Canine Disc Championship Series. 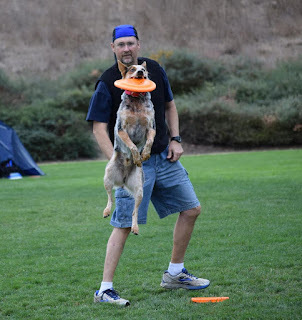 Beginning July 1, 2016, only Hyperflite discs, will be permitted in the Skyhoundz World Canine Disc Championship Series at all levels of competition. For clarity, from July 1, 2016, going forward, at all Skyhoundz competitions (including, but not limited to, Local Championships, State Championships, DiscDogathon Qualifiers, Skyhoundz Classic Qualifiers, Xtreme Distance Qualifiers, DiscDogathon World Championship, Skyhoundz Classic World Championship, and Xtreme Distance World Championship), all competitors are required to use genuine Hyperflite discs. This change will ensure that the Skyhoundz Series will be around for future generations of canine disc enthusiasts to enjoy. Specific Skyhoundz disc-use rules can be found on our individual event rules page here: https://skyhoundz.com/competition_rules.html. Why is Skyhoundz requiring that only Hyperflite Discs be used at its competitions? In a word, we want to ensure the long-term future of canine disc sports. Hyperflite’s support of the Skyhoundz Series is crucial to our plans to grow the sport, around the world, and provide more competitive opportunities for canine disc enthusiasts. *Skyhoundz supports its organizers by permitting them to keep every penny that they make from staging a Skyhoundz competition which, in turn, helps those organizers grow the sport. *Skyhoundz has twice as many canine competitions as the other major organizers combined with plans for even more events in the future. *Hyperflite’s sponsorship allows Skyhoundz to give out nearly 4,000 awards each year, compared to about 1,000, in total, for the other major canine disc competitions. *Thanks to Hyperflite’s sponsorship, the DiscDogathon World Championship, Skyhoundz Classic World Championship, and Xtreme Distance World Championship, and the banquet and other special events held in connection therewith, are always free to qualifying teams. *Of the major canine disc competition series, Skyhoundz is the clear innovator when it comes to the addition of exciting new competition formats, divisions, and classes designed to appeal to every canine disc enthusiast. *Skyhoundz wants to double the number of canine disc competitions in the Skyhoundz series in the next five years as well as add new competition formats, but we can’t achieve that goal without the support of all enthusiasts who compete in the Skyhoundz Series. *Skyhoundz receives no sponsorship money from any other source and relies financially on Hyperflite to stage the Skyhoundz Series. Without the support of Hyperflite, there is no Skyhoundz Series. The playing field has never been level for Hyperflite. 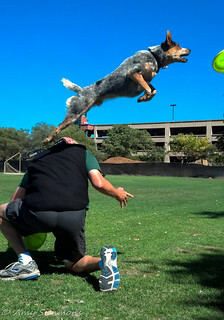 For years, certain domestic and international canine disc competition series have not permitted Hyperflite canine discs to be used in their competitions. This exclusivity has given other disc manufacturers a competitive advantage. 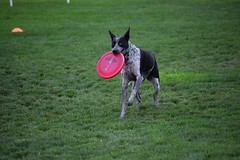 The liberal disc policies of the Skyhoundz Canine Disc Championship Series for the past 15 years have meant that other disc manufacturers have profited from selling discs to canine disc enthusiasts who compete in the Skyhoundz Series, while not supporting the Skyhoundz Series at all. These same disc manufacturers also “cherry pick” successful teams who then compete with the sponsor’s discs in the Skyhoundz Series, knowing full well that Hyperflite, as a sponsor of the Skyhoundz Series, cannot ethically sponsor individual teams in its own sponsored competitions. These manufacturers then promote the successes of their sponsored teams to the detriment of Hyperflite. To put it another way, existing manufacturers have, in essence, preferred to go the cheaper route of sponsoring individual competitors, rather than a full competition series like Skyhoundz. So, while a few elite teams benefit from personal sponsorships, profit-oriented disc manufacturers have avoided paying their fair share to those competition series that provide the competitive opportunities that are the lifeblood of the sport. Not only that, Hyperflite faces pressure from companies that have copied Hyperflite’s patented disc design. We have actually observed competitors throwing “knock off” Hyperflite discs at Skyhoundz competitions in Asia and elsewhere. Adding to the pressure, in the past few years, at least three new canine disc manufacturers have introduced discs that these manufacturers hope to sell to canine disc competitors. Not one of these new disc manufacturers meaningfully supports any of the organized canine disc competition series. A level playing field will demonstrate which companies are committed to the sport, and which companies are simply committed to their bottom lines. Now that the free ride is over, our hope is that the other disc manufacturers will do what they should have been doing all along and, as a consequence, all canine disc competition series will benefit and enjoy the resources necessary to grow and thrive. Why make this change now, instead of at the beginning of the season? The change was originally planned for the beginning of the year, but before implementing it, we wanted to be able to offer competitors who preferred a classic style disc, a viable option — hence, the newly available Hyperflite Z-Disc. With Z-Disc availability now at 100%, further delays are unnecessary. We have always done our best to do what is right for competitors. 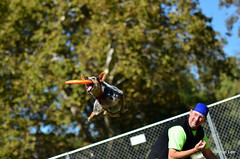 As such, all competitors who have qualified for our World’s with other manufacturer’s discs will remain qualified, though they will have to use Hyperflite discs at their respective Skyhoundz World Championship (DiscDogathon World Championship, Skyhoundz Classic World Championship, and Xtreme Distance World Championship). In addition, we wanted to give competitors an opportunity to become comfortable with Hyperflite discs before requiring their use in competition. Announcing the change, as we have, on Friday, May 13, 2016 will give teams six weeks to make necessary adjustments before the rule change takes effect on July 1, 2016. This should give everyone plenty of time to adjust to new discs to the extent that they do not already use Hyperflite’s canine discs. To conclude, Hyperflite’s demonstrated commitment to our beloved sport will not change, and both organizations look forward to even greater things for the Skyhoundz Series, and the disc dog community, going forward. "... We suspect that we won't change anyone's mind with this follow-up post, but we want to clarify a few points. We may not be the "sharpest knives" in the drawer, but we did have an inkling that this might be an emotional issue for many competitors. And, we expected the greatest amount of emotion on the matter would flow from those who don't have a history with Skyhoundz, as well as those who have a vested interest in the status quo. We were amused by the irony of the fact that many of the loudest voices have probably competed, or currently compete, in a contest series that has a restrictive disc policy (i.e, no Hyperflite discs permitted). We realize that it's common for people on the internet, to overreact and occasionally take extreme positions via their posts. To those people we say, take the time to educate yourselves on what Skyhoundz and Hyperflite have done, and continue to do for the sport. Find out where we have come from, meet us, or, if you are feeling really adventurous, try a Skyhoundz event. When you do, we are confident that, even if you prefer a different disc or a different format, you will find that our hearts are in the right place. We do regret that we weren’t able to have the Z-Disc ready in January, as was our original intention. Our reason for holding off on the announcement was that we wanted to have an alternative disc choice available for those who prefer a classic-style disc. As many of you know, we have been working on the Z-Disc for a few years, and didn't want to release it until we felt that it was the best classic-style option available. While the timing of our announcement was not ideal, we feel that six weeks before a Qualifier and four months before the Worlds (give or take), is a reasonable amount of time to get used to used to Hyperflite discs. We were a little surprised that so few people gave us props for our history with the sport and continuous commitment to growing and promoting canine disc sports worldwide. No other canine disc manufacturer can match our history in the sport, our investment in a competition series, money raised for canine disc clubs, or our charitable (and personal) efforts to promote the adoption of shelter dogs. We provide free local events, offer free training materials in numerous languages, regularly host clinics for free, and we organize — with the help of disc dog clubs around the globe — a world championship extravaganza that includes three distinct world championships (DiscDogathon, Skyhoundz Classic, and Xtreme Distance). Our Skyhoundz World Championship is widely regarded as the best event of its kind. We do this not only because it is good business, but because it's the right thing to do and we love doing it. That said, we do have a few non-business motivations when it comes to canine disc sports, the first being to encourage the adoption of homeless canines through humane societies and rescue organizations. Second, and selfishly, because this sport is our heritage (both founders are former canine disc world champions) we don’t want to see our great sport wither away and die as it nearly has on a few occasions, through apathy, lack of a major sponsor, infighting, or politics. With regard to the safety of Hyperflite discs, they are not, as one poster suggested, hard on dog’s teeth. 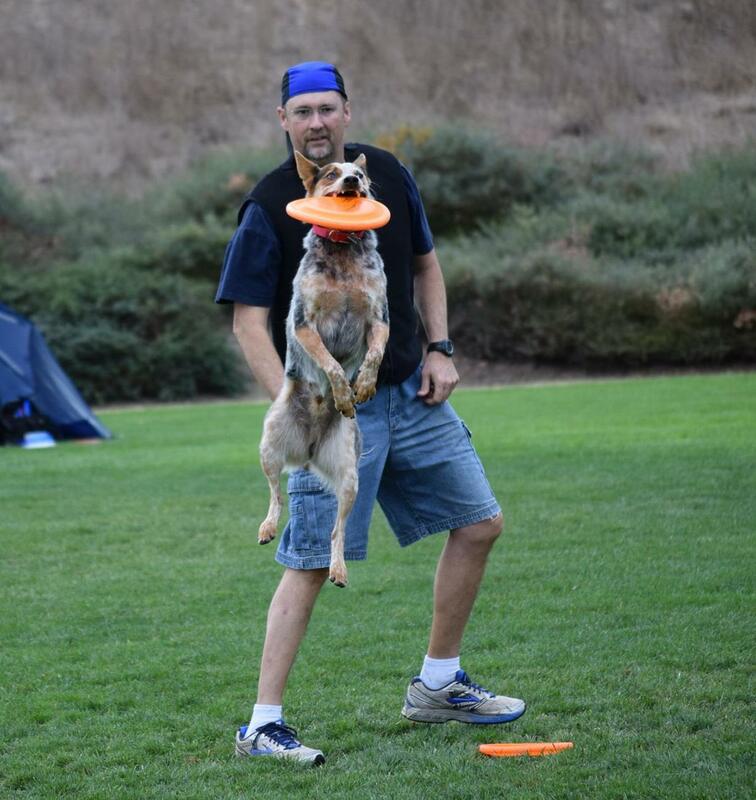 Hyperflite discs are in fact, designed to be safer and easier on canine teeth than our competitor’s discs. We were making softer and more flexible canine discs before many other canine disc manufacturers were even in existence. If your discs shatter in the cold, then they aren’t Hyperflite discs. 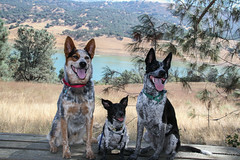 If you have a tough biting canine and have a puncture resistant disc, it was Hyperflite that made that possible. We offer the largest number of soft and safe, competition-quality discs for dogs: SofFlite, SofFlite Pup, HyperFlex, HyperFlex Pup, Jawz Lite, FrostBite, and FrostBite Pup discs, with more variations in the pipeline. Look for more Z-Disc choices in the future as well. To those who have always supported us in our efforts, including those who wisely chose not to pin a “bullseye” on their backs by joining the public discussion, we applaud your discretion and we appreciate your support! After 16 years and many thousands of Skyhoundz competitions, we’re just getting started, and we have many friends who we know will stand by us as we journey onward. We are thankful for your support. Finally, to those of you who flamed us online, not only do we not hold grudges, we’re so old that we'll probably forget what you said by tomorrow anyway. You and your canine companions will always welcome at Skyhoundz events. Peter, Jeff, Greg, and Laura"
To be honest, the response may or may not help. The community was doing a fine job of "self-policing" reactions, but it is what it is. Right? We're filtering out the spammers, sorry for the inconvenience. 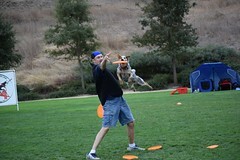 Who Started This Sport of Disc Dogs? *Champion. : someone or something (such as a team or an animal) that has won a contest or competition. | One that wins first place or first prize in a competition. Copyright, Vader's World, 2013-2018. Simple theme. Powered by Blogger.